When people visit Santa Cruz, they usually head for the Boardwalk, the Pier, the Wharf, downtown, or one of the many beaches and coves. They don't usually find themselves driving on Mission Street. It's one of the main arteries of Santa Cruz (it eventually becomes Highway 1), and it's full of stop lights and cars. Locals usually take side streets to avoid the traffic, and it's lined with faded-looking storefronts that you wouldn't think to look at. But there are quite a few gems on Mission Street worth stopping for: Sylvan Music, Vasili's Greek Restaurant, Cafe Brasil, to mention just a few. 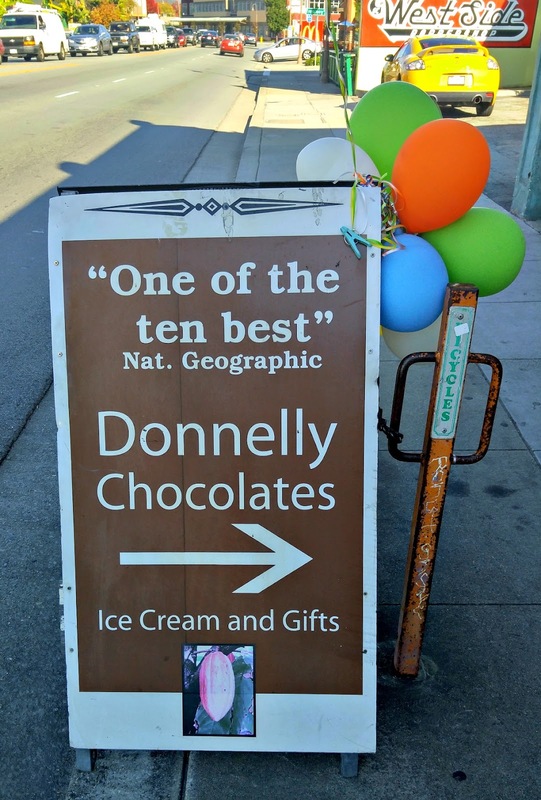 One real diamond in the rough is Donnellys Chocolates, an artisan chocolate shop located near the corner of Mission and Bay. If you love chocolate, it's definitely worth making a small detour from your regularly scheduled Santa Cruz itinerary. 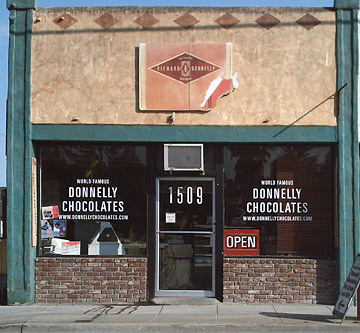 It's easy to drive right past Donnelly Chocolates because its storefront is so unassuming. There are no fancy window decorations whatsoever, and only a small sidewalk board gives you any clue that this is a chocolate shop worth stopping for. The inside of the store is just as simple as the outside. It's clearly a place where people are focused on making chocolates, not displaying them. Even their website (www.donnellychocolates.com) doesn't do the chocolates justice! You wouldn't think that the chocolate sold here has won awards like "Best Artisan Chocolate" at the Eurochocolate Festival or "10 Best" from Bon Appetit and National Geographic. 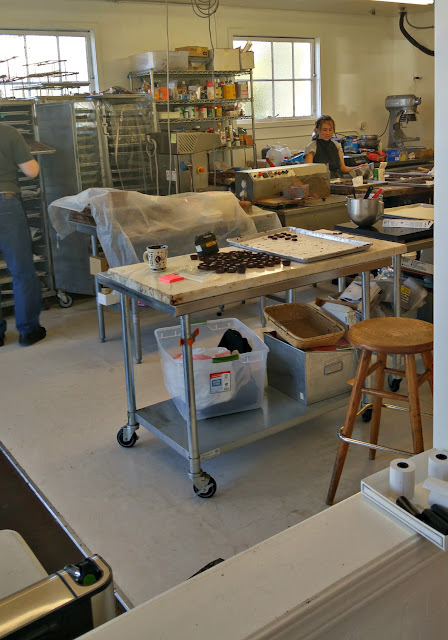 To get any inkling of how good their chocolate is, you have to taste it. Fortunately, they are incredibly generous with their samples! 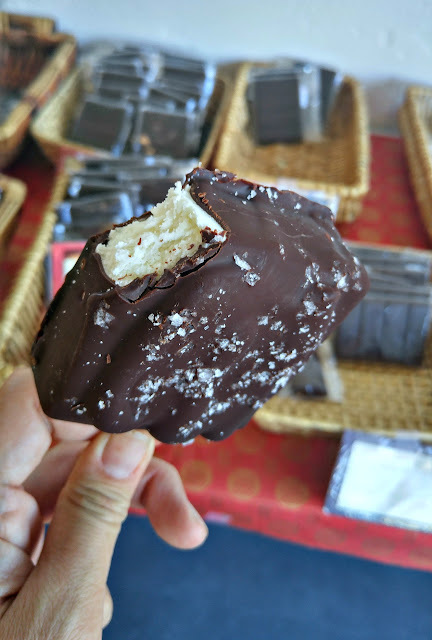 When we asked whether any samples of their sea salt caramel chocolates were available, owner Richard Donnelly opened up a bar on the spot, and my kids couldn't believe the size of the chunks he gave them. 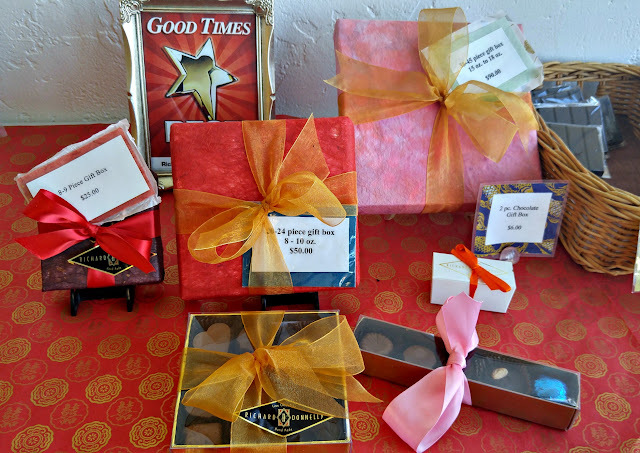 They have all kinds of chocolate truffles, chocolate caramels, chocolate covered nuts, and chocolate bars. Truffles sell for about $1.50 each and the bars sell for about $5 each. I love that there are actually more dark chocolate varieties than milk chocolate. 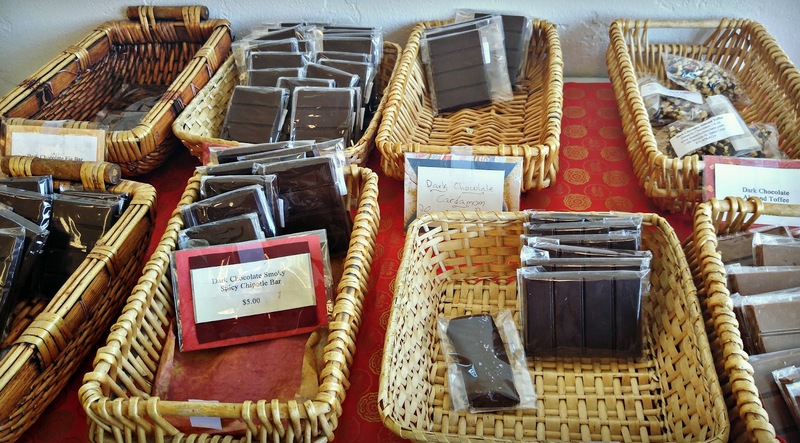 Even the "plain" chocolate bars they sell are infused with ingredients like lavender, fig, five spice, cardamom, chipotle, and all kinds of good stuff. 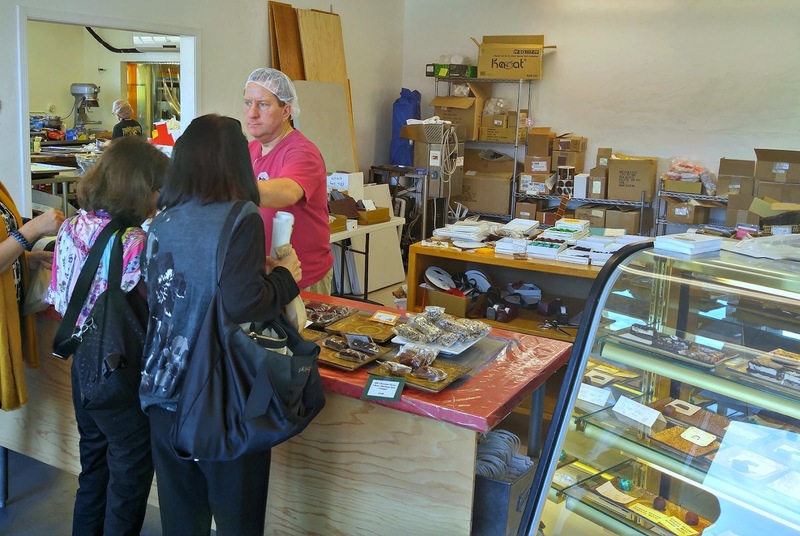 It's really a place for people who know their chocolate and love their chocolate. One of the best things in the store is their chocolate ice cream bar. You get premium vanilla ice cream and caramel, covered with dark chocolate, dusted with sea salt on one side and chopped almonds on the other side. It is the most decadent ice cream bar I've ever had. Absolutely divine! After those samples, we wanted to buy up the whole store, but you have to act fast because their stock doesn't last long. We entered their store before having lunch, and by the time we returned for dessert, the last chunk of rocky road and almond-sea salt caramel had been sold. 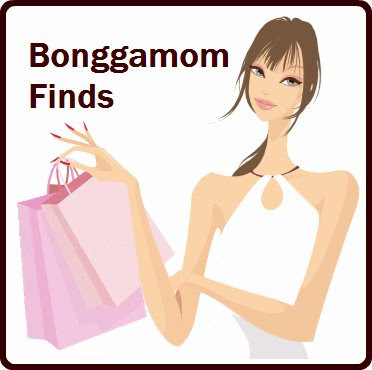 This store has officially been added to our Must-Visit list whenever we go to Santa Cruz!